A tantalizing, quirky, technically-exciting concept phone that gives us a glimpse of Vivo’s future smartphone innovations. 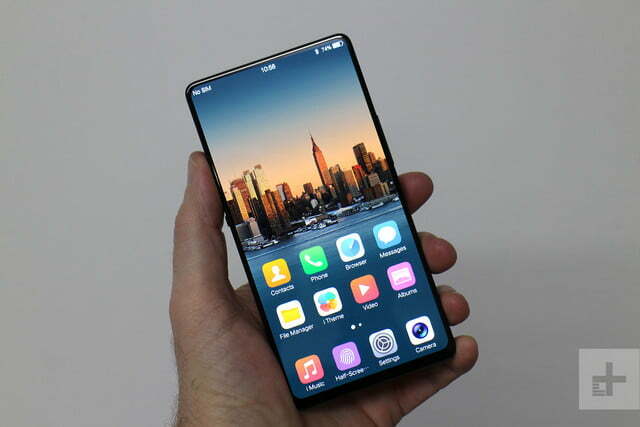 Vivo made a splash at CES 2018 with its in-display fingerprint sensor, the first operational version on a production-ready phone we’d seen, and it’s back at Mobile World Congress with the Vivo Apex — a concept phone featuring technology we could see on future devices from the company. We should stress that the Apex isn’t about to hit shelves, so if you like what you see and want to go and buy one, it’s not possible. When you first see the Apex, it’s the size of the screen and apparent complete lack of bezels that hits you. 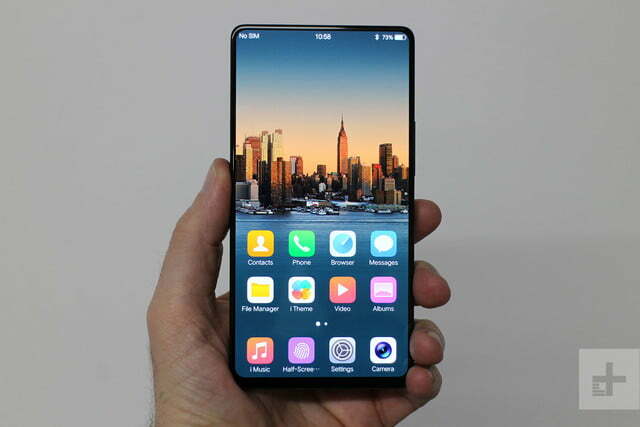 If Xiaomi revisited the original Mi Mix in 2018, this is what it would look like. It has an astonishing 98 percent screen-to-body ratio, way beyond any other phone we’ve seen so far. The bezels around the 5.99-inch screen are just 1.8mm thick, while the chin extends just 4.3mm. They’re almost impossible to spot around the sides. This gives the Apex a wonderful in-hand experience — you’re completely immersed in whatever is on screen, and video looks especially impressive. It also has the modern 18:9 aspect ratio, and a decent 2,160 x 1,080 pixel resolution. The Apex phone is the perfect size. It fitted in our palm precisely, and didn’t require too much stretching to use one-handed. 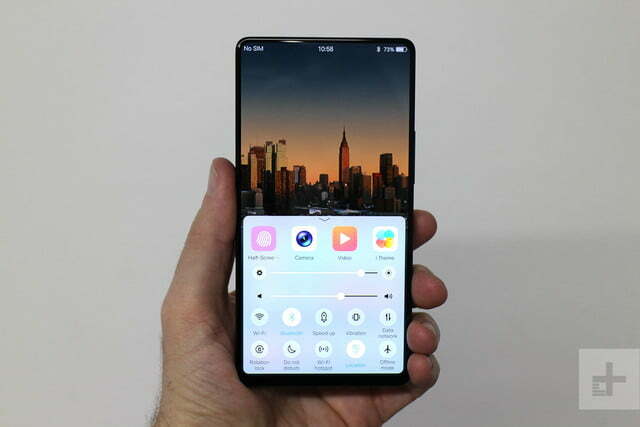 However, the software was a highly customized version of Android with some successful tweaks — like flicking up open apps to close them from the pull-up menu bar — and some less so, such as the iOS-esque notification shade. But the software wasn’t the focus, and when you hold the great-looking, Apex everything else gets forgiven. 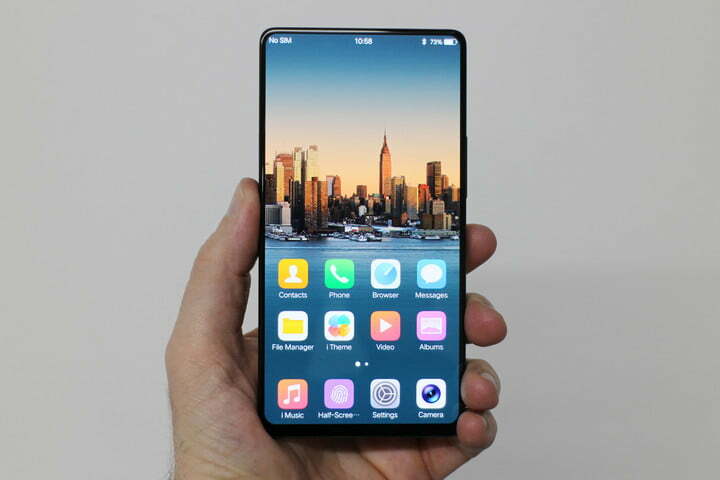 The monstrous screen means many essential components usually around it have been misplaced, which has opened the door for Vivo to express its creativity, and show off some more clever tech. 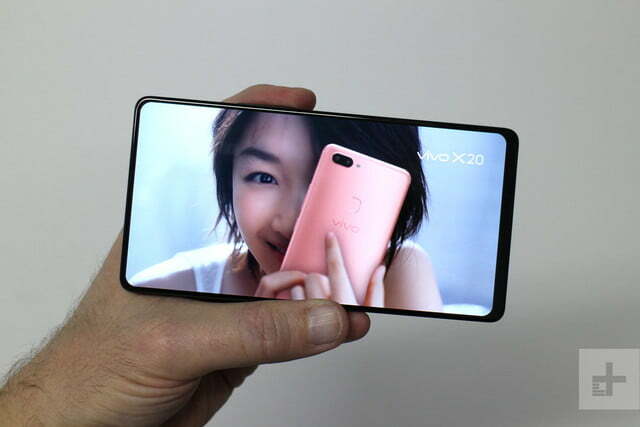 A new speaker system that Vivo calls Screen SoundCasting turns the entire 6-inch display into a sound-conducting panel, replacing the usual speaker in the top bezel. Hold it against your ear and sound comes through the front panel clearly. When you hold the great-looking Apex, everything else gets forgiven. 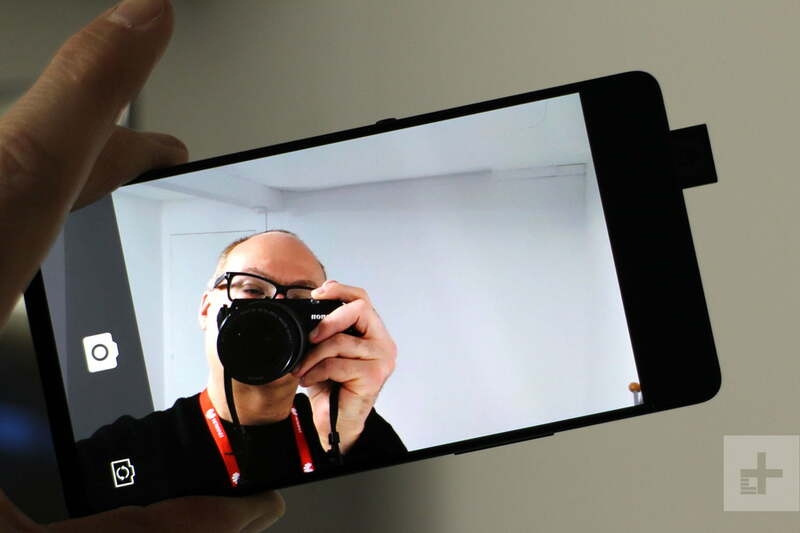 We listened to some test calls and the audio quality was great, considerably more realistic and natural than the system used on the original Mi Mix, for example. The voices had more depth, less harsh treble, and sounded excellent. Vivo says Screen SoundCasting is energy efficient and minimizes sound leakage, increasing privacy, too. Positioning doesn’t matter here, and listening through the top part or the bottom part of the screen only produced slight volume changes. 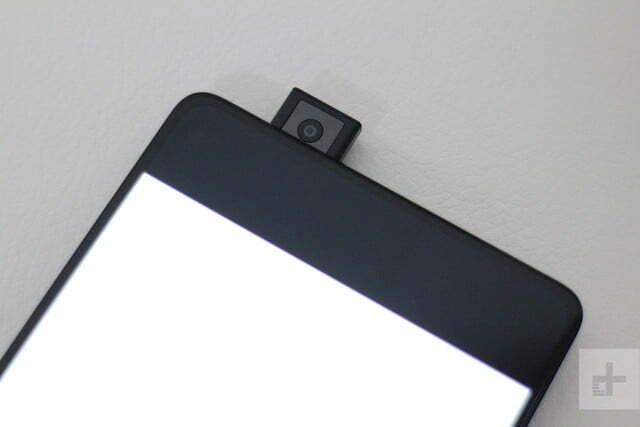 The ambient light sensor has been relocated to the top of the device, and the proximity sensor is under the screen; but where is the selfie camera? Open the camera app and tap the selfie cam button, and out of the top of the phone rises an 8-megapixel camera, ready to capture your photo. You’ll definitely be smiling, as it’s just so much fun to watch. Press the selfie button again, and it retracts back inside the Apex. Although it only takes 0.8-seconds to appear, it does feel a little long, and we’d rather it popped up instantly, though this could ruin the visual impact. Additionally, we’re always worried about snapping protruding parts off in an accident, and would hate that to happen here. Finally, we come to the under-glass fingerprint sensor. On the Apex, Vivo has introduced a half-screen sensor, which means you aren’t limited to a single spot to touch when unlocking the phone. 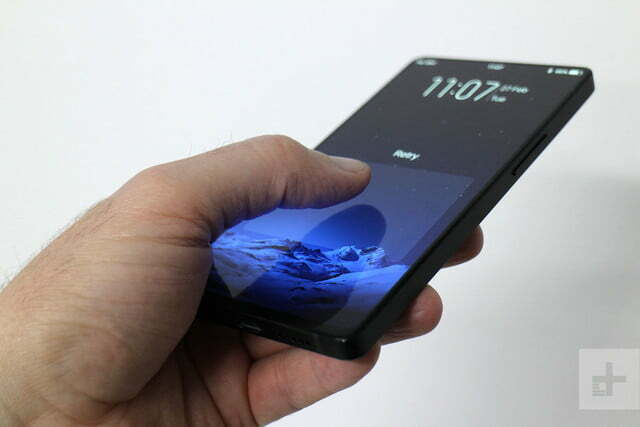 Because more screen real estate is available, you can use two fingerprints at the same time to unlock the device, and they don’t even have to be from the same person. This could be helpful when securing individual apps — a banking app, perhaps — but rather inconvenient for the device itself. While we love the additional space, the system was very much a work in progress. Registering our print was quick and easy, but getting the phone to recognize it was considerably more difficult. We needed multiple tries, and it was nowhere near ready for general use. Vivo isn’t positioning the Apex as a production-ready phone, so it’s not much of a problem, but it is evidence of how difficult it is to implement an in-display fingerprint sensor. Vivo isn’t working with Synaptics on the Apex, unlike the sensor fitted to the Vivo X20 Plus UD. It has an astonishing 98 percent screen-to-body ratio. The lack of polish on the fingerprint sensor didn’t dull our excitement about the phone. The screen alone makes it worthy of attention, and the cute, slickly-implemented selfie cam makes it fun and gives it even more flair. Vivo continues to be a company unafraid of not just pushing smartphone tech forward, but showing it off too. Rarely do we get a chance to see these concept devices, which are often displayed internally before being adapted, diluted, and released in a different state. The Vivo Apex gives us an enjoyable look at how Vivo’s innovating. The official word from Vivo is some, or none of the technology here may arrive in a future phone. It hasn’t been decided. 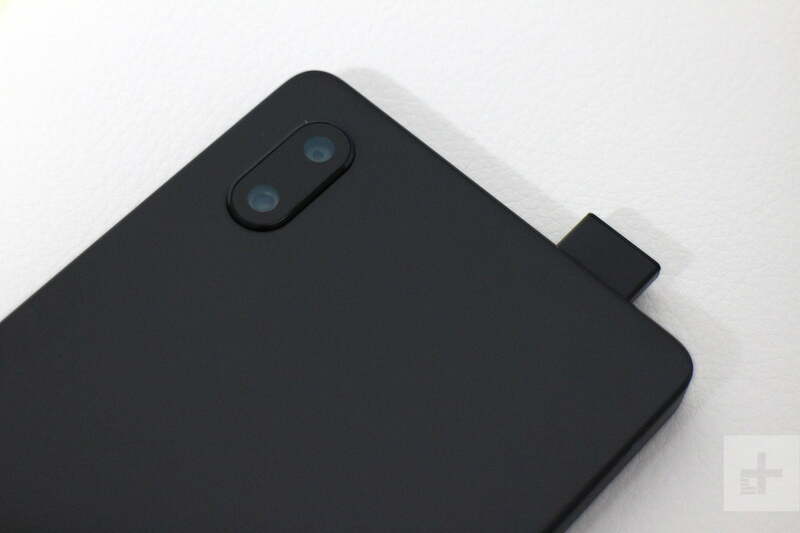 We’d be surprised if we didn’t see the stunning screen used on a production device, with a refined version of the selfie camera sometime in the future — they’re too good not to release. The fingerprint sensor is a work-in-progress, and hopefully the next iteration we try will be better. The Vivo Apex is a cracking, tantalizing, playful smartphone that may be the shape of things to come.